A political leader who has spent much time cosying up to Rupert Murdoch faces difficult questions from a broadcast journalist a few days before a crucial electoral test. The leader accuses the journalist of “heckling” him. The press conference has been infiltrated by supporters who applaud their leader loudly and drown out the journalist’s questions with heckles of their own. The leader accuses the journalist of bias – without citing evidence – and says he expects the broadcaster to “co-operate” with a leak enquiry and reveal its sources. The leader then organises a mob of supporters to surround that broadcaster’s offices, carrying banners accusing the journalist of being a corrupt liar and demanding that he be fired. Tony Blair’s New Labour going for the BBC after they accused Number Ten of sexing up the dossier about Weapons of Mass Destruction? Vladimir Putin? No: this was Alex Salmond clashing with Nick Robinson, the BBC’s political editor, when he asked about the future of RBS if Scotland votes yes to independence on Thursday. Salmond’s bullying raises a dangerous precedent and is a sobering warning of how media freedom might fare in an independent Scotland. I hold little affection for Alistair Campbell, but even he stopped short of sending a mob from Labour HQ to Broadcasting House to demand that BBC journalists lose their jobs. Why aren’t the left queuing up to express outrage about a politician making such threats to a public service broadcaster? It should be the role of the intelligent left to call time on such humbug, but too many have sat on the fence or fallen for the “Yes” campaign hook, line and sinker. Never has the absence of Robin Cook and Donald Dewar – two Labour politicians who would be able to demolish Alex Salmond with withering scorn – been felt so keenly. It’s easy for Alex Salmond to portray himself as the underdog fighting against a cosy consensus in Westminster. Prime Minister’s Questions last Wednesday, with Cameron, Clegg and Miliband away campaigning in Scotland, was almost a love-in between stand-ins William Hague and Harriet Harman as they kept agreeing with each other about the dangers of a Yes Vote. Despite John Major’s petulance – the ex-PM thundered in the Times last week that a Yes vote would be all Labour’s fault for having let the Devolution genie out of the bottle in the 1990s – there seems to be a temporary truce between Labour and the Tories. But with only a few exceptions (well done to the Independent‘s Yasmin Alibhai-Brown and the Guardian‘s Seamus Milne for breaking the lazy consensus) it’s amazing to witness how little scrutiny commentators on the left have paid to the Scottish National Party and its case for independence. While the coalition government’s policies like the bedroom tax (which most SNP MPs did not turn out to oppose in parliament , incidentally) increase inequality and penalise the poor, it’s lunacy to see the referendum as way of stopping such policies. The nationalists’ case for independence is a curiously schizophrenic one: on the one hand they argue that independence will be the seismic change that Scotland cries out for. On the other they argue that there won’t be any change at all: the BBC, the Monarchy, the Pound sterling and free cross-border movement will all carry on as if nothing has happened. Scandinavian levels of public services will be delivered with Irish levels of taxation. To argue, as George Monbiot recently did in the Guardian, that a Yes vote would show that “hope, marginalised at first, can spread across a nation, defying all attempts to suppress it” shows just how deluded many on the Left have become. For good measure, Monbiot adds that we should support independence anyway, because the Daily Mail is against it. Never has that old Sanskrit proverb rang so true: the enemy of my enemy is not my friend. Although he stops short of backing a Yes vote, the Guardian‘s Owen Jones swallows the myth that “New Labour’s surrender to the underlying assumptions of the Thatcherite crusade gave the independence movement its greatest opportunity” – forgetting that for much of the 1990s and 2000s, the SNP was calling for tax cuts (its 2003 manifesto pledged to cut business rates and corporation tax, and freeze income tax) and once in power the SNP has not used its tax-raising powers to defend the Scottish NHS from Tory cuts. The Scottish Labour party may be many things – lazy, complacent and paternalistic for starters – but in Tony Blair’s pocket it never was. Billy Bragg’s silly attempt to defend nationalism as a bedfellow of socialism (didn’t Europe have enough of ‘National Socialist’ political movements in the twentieth century?) fails to explain why Scotland needs to be independent to become fairer and more equal. Compass thinks the referendum is a bit like a conference workshop, the final communiqué is less interesting than the discussions that were had along the way. If Scotland votes yes, then no worries: as long as we get “an independent Scotland being as much like Denmark as possible, so we get a better Scotland and a beacon of progressive light that shines on UK”. Such fence-sitting is preposterous: shouldn’t we want Scotland to become a better, fairer Scotland, not an imitation of a Scandinavian nation? Compass, which claims to be “building a Good Society; one that is much more equal, sustainable and democratic than the society we are living in now”, is curiously silent about the future of the British nation-state. Compass forgets that a “good society” is not just a collection of policies and politicians we agree with, but is always based on collectivism, co-operation and compromise. How dividing the UK in two would give its people more “agency” to build a good society is not explained. In this world view, nationalism is always a noble cause as long as it does not carry an English, or British, label. Anything that David Cameron opposes is automatically a good thing. Never mind that the Yes campaign is supported by transport magnate Brian Souter – who spent one of the many millions he made out of rail privatisation trying to stop the repeal of the anti-gay clause 28 – or the tax exile Sean Connery. If the Tories are against it then it has to be anti-establishment, right? Far from being generous solidarity with the downtrodden Scots , for London-based commentators to advocate a Yes vote is vanity pure and simple: I have nothing to lose, and a lot of street cred to gain, by joining the bandwagon. The rhetoric used by those on the left that advocate a Yes vote (“Lights that will never go out”, “hope… can summon up passion and purpose we never knew we possessed” and so on) is as vacuous as the New Labour spindoctors and the Clintonesque triangulators they claim to despise. By far the most spin of this campaign – including a slick campaign video that equates national independence to the freedom of the wind in your hair as you drive down a country road – comes from the Yes campaign. Portraying Alex Salmond as a kind of Tartan freedom fighter, shaking off the shackles of neo-liberal economics through his “struggle” to liberate the oppressed Scottish people from the colonial yolk of London, is absurd. In fact Scottish voters are in some ways to the right of English ones. Although the Tories have declined steeply in Scotland since the 1950s they did so not because of Thatcherite policies like the poll tax but because of their opposition to devolution: in the 1992 election the Tories’ share of the vote was actually up on 1987 – from 24 to 25.6% – and it fell to an all-time low of 15% not in 1997 but 2001. The Scottish Tories have since adapted: although there is only one Scottish Tory MP at Westminster the Tories have done well out of the complex PR system that operates for Holyrood elections and currently have 15 MSPs, three times as many as the Lib Dems. The Scottish Tories’ leader, Ruth Davidson, is widely regarded as having had a good referendum campaign, articulating cultural and historic arguments for the union better than most Labour politicians. As the Tories have fallen in the polls in England and Wales since 2010, in Scotland their support has, remarkably, recovered: several polls since 2012 have put the Tories at well above 20% in Scotland. To interpret the referendum campaign as an opportunity to “wipe out the Tories” in Scotland ignores the fact that an independent Scotland might, within a decade or two, freely elect a Tory government of its own. A Yes vote may be not the start of a new era of progressive politics, but the beginning of its end. The Tories are still the third party in Scottish politics, well ahead of the Lib Dems, and neither Labour nor the SNP are invincible: the SNP had a serious wobble under Jon Swinney’s leadership in the early 2000s before Alex Salmond was re-elected as Leader. Labour unexpectedly lost the Scottish elections not once but twice, in 2007 and 2011. Scottish politics is fluid and complex and its politicians -like their Westminster counterparts – do not have a monopoly of wisdom. And it’s easy to forget that far from being advocates of devolution, the SNP opposed it throughout the 1980s and 1990s: classic factionalists, they could not tolerate any idea to benefit Scotland that originated outside their party. The left has forgotten that New Labour never had a monopoly on spin: Alex Salmond’s Yes campaign has been a merry dance of stage management, smears and misrepresentation. History is constantly rewritten: the SNP’s own website proclaims that “The election of a Scottish Parliament [in 1999] represented a new sang and a new start for Scotland. Expectations were high that devolution would deliver a real difference and MSPs were cheered into their temporary offices on the Mound.” This conveniently omits to say that the SNP had, like the Tories, boycotted the Constitutional Convention that led to the referendum that had set the parliament up. The SNP let Labour and the Lib Dems do all the heavy lifting and only jumped on the bandwagon of devolution after the hard battle had been won. I tread on the subject of Scottish independence with care. Although I love Scotland, since I walked the West Highland Way ten years ago my visits have been infrequent and short. Alexander Grant is as Scottish a name as they come (my namesakes include a leading light of the pro-independence Business for Scotland, a former principal of Edinburgh University, a Scottish-born poet, an academic specialising in the history of Scottish feudalism, and a Scotsman who invented both a unique Scottish fiddle and a unique Scottish fishing rod). But I don’t have any Scottish blood myself. Although my paternal grandfather was born on the Isle of Wight (about as far from Scotland as is possible in Britain) us Grants always assumed we were descended from Scots who had come south at some point in the nineteenth century: it was a disappointment when an uncle started genealogical research a few years ago and discovered that our branch had been in the Isle of Wight since at least the sixteenth century. The Grant name originally wasn’t Scottish at all – it’s a corruption of the Norman Grand (or, some argue, the German Grandt) which spread north of the border in the thirteenth century. I’m proud of my name and I’m flattered when people mistakenly think I am Scottish. But its etymology – like many other common Scottish surnames – shows just how intertwined Scotland, England and the rest of the English-speaking world are. Notable Grants include a United States president, an Israeli football manager, an English astrologer, a Guyanese reggae singer and leading actors (Cary and Hugh), neither of whom was born in Scotland. Grant’s a Scottish name, an English one and a British one all at once – and it’s impossible to separate these identities. Whatever the outcome of the referendum there will need to be a post-mortem on why Better Together – which has relied too heavily on yesterday’s men like Gordon Brown and Alistair Darling – lost its way so badly in the last month of the campaign. The Better Together/No campaigns should have talked a lot more about the cultural and historic case for the Union, not just the economic one – for too long the No campaign has obsessed over whether independence will cost Scottish households £500 here or there. 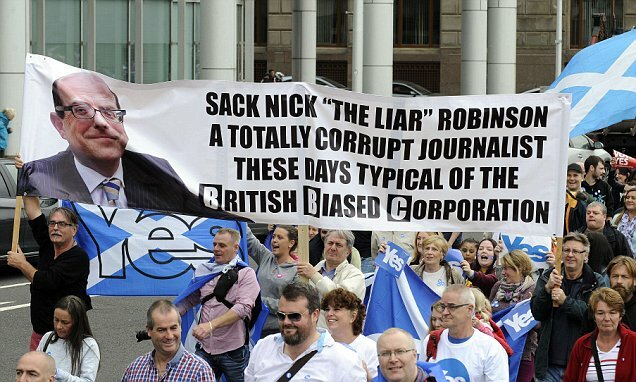 The No campaign has cried wolf too often, allowing genuine dangers of independence to be brushed off by Salmond. A friend recently posted on Facebook “Ed Miliband raising the prospect of border guards. They are so fucked and they know it.” Actually, for once this scare story was not panic at all. Even if an independent Scotland does get accepted as an EU member state (which is a big if) why wouldn’t there be border guards at Gretna Green? As any euro-anorak knows, the UK has consistently refused to join the Schengen free-travel area, which explains why there are passport checks at Dover and Calais but not on the land frontier between France and Belgium (there may not be a physical border between the Republic of Ireland and Northern Ireland, but that’s a product of a peace process and 20 years of painstaking negotiations about cross-border co-operation). Our political discourse is so focussed on the here and now of Westminster politics that the long-term achievements of the United Kingdom are overlooked or taken for granted. As I tell my eight-year-old daughter from time to time, to have been born in the UK in the late twentieth or early twenty-first century is like winning the lottery: never have we enjoyed a period of such uninterrupted peace and prosperity. In the 1980s foreign perceptions of Britain were coloured by IRA terrorism, industrial decline and football hooligans: thanks in part to devolution, Britain is today a much more pluralistic nation in which cities like Glasgow, Edinburgh and Cardiff have prospered as well as London and Manchester. Despite turmoil in the Middle East fuelled by Blair’s misguided military adventures, and the increasing threat of a new Cold War, Britain is still much more respected around the world than the US or most other European nations. Britain’s record on human rights and freedom of speech – while not perfect – is much better than almost all other western countries. Our universities, hospitals, theatres, museums, scientists, newspapers and broadcasters (especially the BBC that Salmond’s cronies so despise) are among the best – if not the best – in the world. Compared to most European nations, Britain’s race relations are remarkably good and for all its faults, UKIP’s rise has been accompanied by a welcome (and under-reported) implosion of the BNP, who now only have two councillors in the UK – neither of them in Scotland. As the French ponder Front National mayors taking charge of their cities, in the UK the Far Right is in retreat. Britain’s – and Scotland’s – over-dependence on financial services may have helped cause the collapse of the banks in 2007, but it is to British economists and thinkers that the world has turned to re-calibrate the economy since. While the UK remains unequal and London has too much power and wealth, relations between England, Wales and Scotland are a bed of roses compared to inter-regional strife in Spain and Italy. The peace process in Northern Ireland, ending 40 years of carnage, is envied around the world. The UK is worth fighting for. It’s a successful union in which power has been successfully devolved – thanks largely to Labour, but not exclusively – and regional identities have flourished. Across the world there is bafflement that armchair commentators in London are joining forces with the egotistical Alex Salmond to try and destroy it. Leaving one of the world’s most enduring and successful political unions isn’t a price worth paying to have the pleasure of say yah boo to the Conservative-led government of the day. Maybe Compass is right about one thing: politics has “come alive” in Scotland. George Monbiot’s gullibility has even prompted Brian Wilson (the wooden ex-Labour MP, not the founder of the Beach Boys) to find his voice: “Convoluted theories are constructed about how dividing people will actually unite them through some mysterious process of inspiration and example,” wrote Wilson in a brilliant response in the Guardian last week. An independence referendum is not an exam question (“Scotland should be an independent country. Discuss”) or a conference workshop. But if nothing else, at least the referendum campaign has got Labour to, at long last, articulate why the British state is worth preserving, and how it can best be made fairer and more equal if it stays united. I just hope and pray it’s not too late. This entry was posted in Uncategorized and tagged Alex Salmond, Conservatives, Elections, History, Independence Referendum, Labour, Lib Dems, Politics, Scotland. Bookmark the permalink. While Salmond’s showing an unpleasant side over the Nick Robinson fracas, I think the Blair government’s actions over Dr David Kelly and Iraq suggest that particular moral high ground isn’t really available for Westminster politicians.